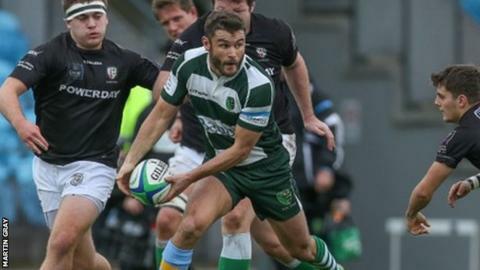 Guernsey are in a "tough situation" after they lost 21-14 at CS Rugby in National Three London and South East, says director of rugby Jordan Reynolds. Guernsey are still five points adrift at the bottom ahead of next week's game with second-from-bottom Tring. "It puts us in a tough situation," Reynolds told BBC Radio Guernsey. "But as hard as it is we've got to remain as positive as we can because there's still a lot of games to be played." Guernsey, who have been hit by a series of injuries to key players since the start of the season, for fielding a suspended player earlier this month and have won just two of their 10 games. "We've got the calibre of player on the park at the moment which maybe we didn't have five or six weeks ago," Reynolds said. "The guys are on there, but you can't just expect that in one week they're going to flick a switch and suddenly be playing the rugby that we were playing this time last year. "We did some good stuff, I think in the second half we had six clean line breaks that didn't turn into points, and this time last year that was 30-odd points. "On another day we'd have scored those tries and that was a 30-point win, we didn't though and that was the frustrating thing. "But at the same time it's a positive and we've just got to try and get finishing those and turning them into points."